Now, do rest assured, this does not mean that your Whatsapp activity will be posted on your wall anywhere by Facebook or anyway. But the data will be used to send info between the companies to create an advertising profile for you. And these messages are often some of our most intimate. So if you want to opt out of this there are two things you can do and both take approx 10 seconds. 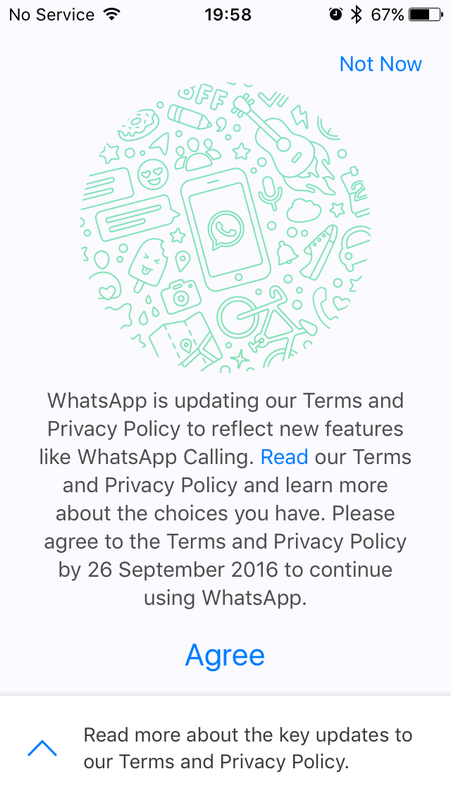 When you next log in to WhatsApp you’ll probably see new terms pop up. 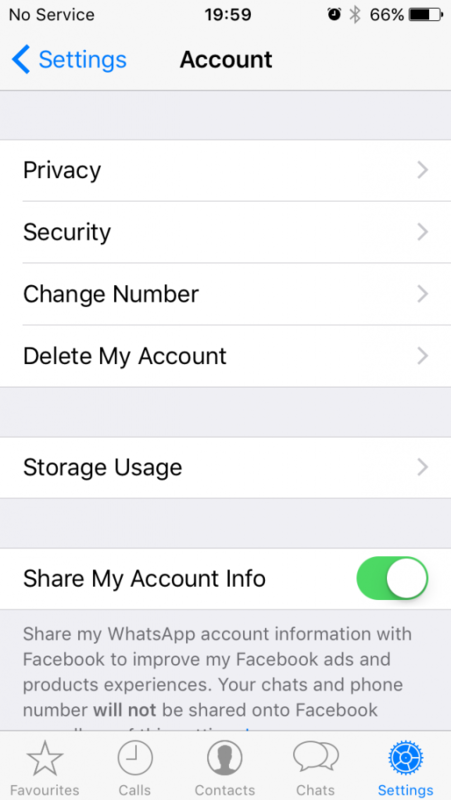 and you can use the button to switch off sharing. But oh no! What if you HAVE ALREADY ticked the new terms (or you aren’t sure if you have). We’re all guilty of all just ticking those boxes. In fact 2012 research cited here on Time.Com suggests it would take SEVENTY SIX DAY to read all the T&Cs we are supposedto read. Seventy six days, people! 1 Stansted Airport is not the super easy quick airport it used to be. I’m sad about this as I served on its Consultative Committee between 2011-13 while it was part of BAA and this was not the airport that was planned then. 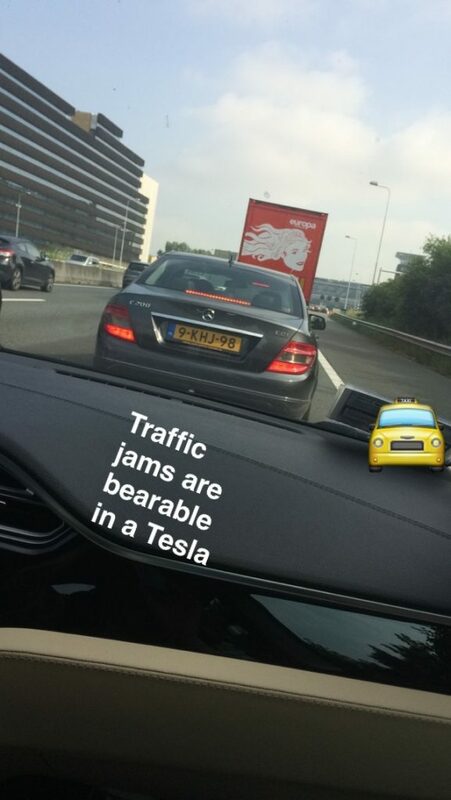 2 Traffic jams are bearable if your taxi is a Tesla. Schiphol airport’s state-of-the-art taxi fleet is comprised of 167 Tesla Model S cars in a bid to reduce its carbon footprint. 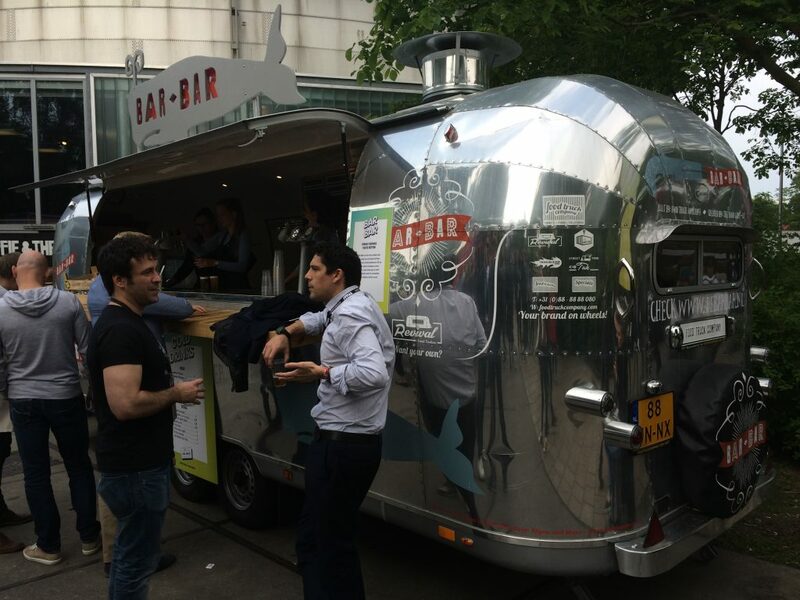 3 As Amsterdam’s the Start up capital of Europe, there were hipsters everywhere… Not for them the traditional burger van, or even an airstream (though there was one of those.) 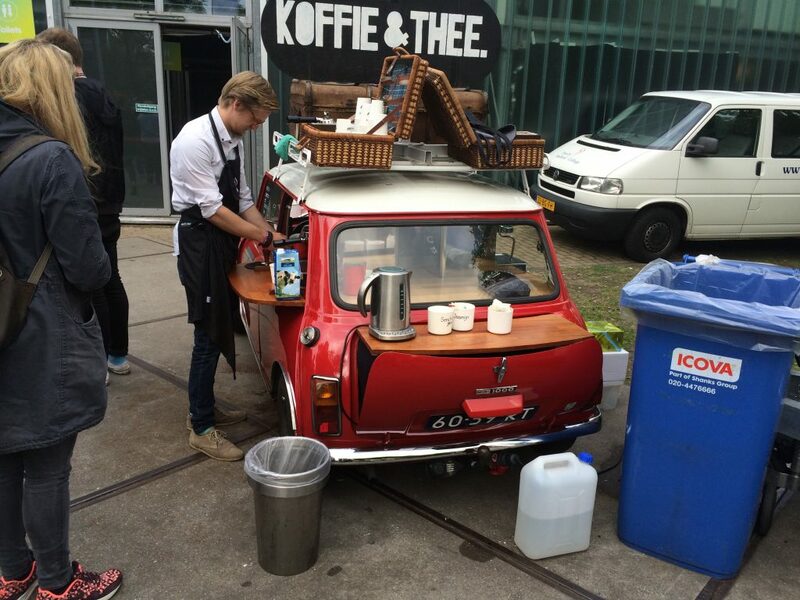 Oh no – the coffee cart was a wicker hamper-be-decked vintage Mini.Very cool. 4 In the communications workshop which was ably lead in a remarkably steam-punk style building by Stephan Fountain from PR CO, we learned the key to great PR is “finding your why. People don’t buy what you do – they buy why you do it. (For more on this and if you have a quick 18 mins to spare (it’s well worth it) watch Simon Sinek’s Start with Why Ted talk. Once you know why your business does what it does – its higher purpose – then you can build your story on this. 5. Moving picture files are NOT a fad. it’s pronounced gif not jif. He spoke about how the whole range of human emotion can be summed up in 5 second videos and more interestingly, how language has evolved from words back to to pictures. AI can be amazing – and anything that machines find easy and people find hard should be outsourced in this way. BUT you need to make sure the good massively outweighs the bad. 7. Julie Zhou from Facebook talked about the aha moment. If you set out to solve a problem with a clear idea of how a solution is going to work out, when you hit setbacks (and you will) you’re more likely to be demoralised. Teams that fall in love with a problem and have conviction that what they’re trying to achieve is meaningful are much more likely to continue to find a successful solution. 8 The catalyst for my trip was funny, energetic and inspirational Gary Vaynerchuk from Vaynermedia The fast talkin’, fast movin’, hustlin’ entrepreneur speaks the truth when he says that patience is all and if you want the results, you gotta put in the hard work – and that means no complaining. What did you think of TNW? Let us know on Twitter. A problem that many entrepreneurs have is merely getting things done. Focus is often a problem as there are so many ideas bubbling and fizzing away in their heads that they run out of “RAM” – I am sure the reason I sometimes can’t remember where my keys are is because my head has too many song lyrics locked in. 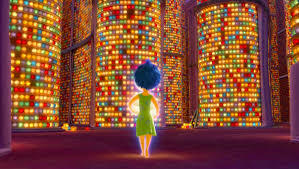 Pixar’s Oscar winning movie Inside Out explores in a touching way how memories work with the idea that our brains house some kind of deep storage. 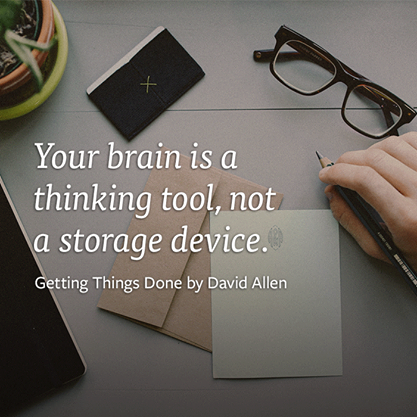 David Allen’s productivity book “Getting Things Done” is my bible for getting all those ideas or “open loops” out of your head so that you can concentrate. If you have two minutes and twenty two seconds to spare, watch this video which explains it really neatly. One key point he makes is ensuring that your to-do list is filled with the right tasks. Many find that once they’ve stopped vaguely thinking about “whether we should go skiing next year?” or “how can we win that customer?” or worrying that they will forget to call the client at the right time that their brain can work in more creative ways elsewhere. Having relevant next actions for managing your communications output is another good way of clearing relevant headspace to ensure that you’re focused on what you want to say and when is the right time to say it. David Allen also quite rightly says “You can do anything but you can’t do everything” – and in terms of social media, he’s certainly right. 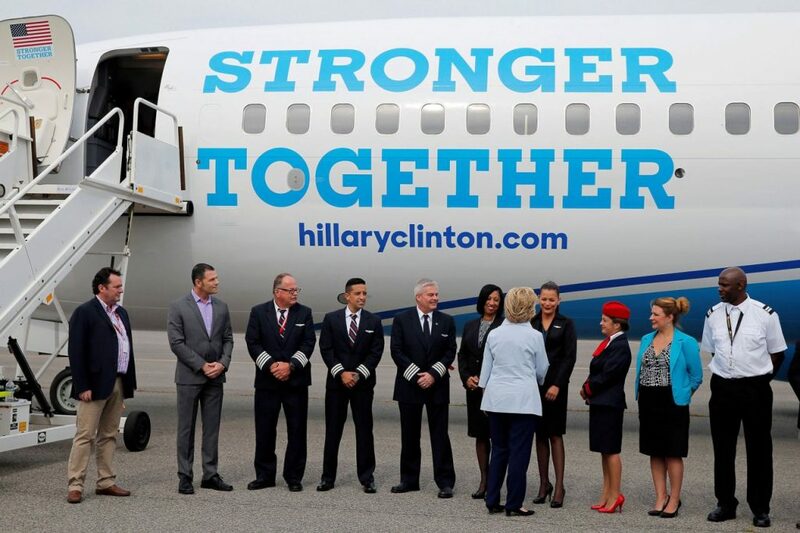 Pick your platform and perfect your participation. How do you prevent overwhelm? Let us know. When people join Twitter one of the first things they realise is that it’s only as good as the people they are following. A few celebrities come up and in particular those with gazillions of followers or believers. Kardashians aside, there are a few which Twitter may even suggest. @StephenFry and Jonathan Ross @wossy were early adopters of the site and really got into it. So today, inspired by Emma Watson’s awesome use of Twitter to found her book club, OurSharedShelf, our inaugural Gingham Cloud 9 is a round up of celebrities who are great to follow on Twitter but you may have missed. @EmWatson – funny, likeable, relatable but still getting things done. 2 @JamesBlunt – the British songwriter regularly pulls out cutting one-liners which shut down trolls fast. 4 @JamieOliver – Don’t worry, the Naked Chef doesn’t fill up your timeline with pictures of his lunch. 5 @EddieIzzard – you’d expect wit from the clever comic and he doesn’t disappoint. 6 @annakendrick47 – Pitch Perfect, as you’d expect from the witty actress. 7 @MisterEdByrne – the former voice of the Carphone Warehouse is brilliant and we won’t hear a word against him. 9 @ZachBraff – the Scrubs star loves Twitter and his fans and it shows. Are there any we’ve missed from the list? Let us know. So the fab hipster app that makes life look fabulous at any hour of the day or night, continues to be the fastest growing social network in the Western world. In fact, today’s news that Lux, the name of one of its most popular filter, is also one of the most popular baby names in the USA , shows just how wide its reach is. We were inspired to pull together this infographic by a recent meeting. The individual in question has a likeable, successful personal brand and is doing brilliant things with newsletters and on LinkedIn, Facebook and Twitter but has been reluctant to get stuck into Instagram, even though the individuality it conveys would work well for the business. You don’t need to post every day, but it’s a great platform for providing insight into your working day, sharing quotes and showcasing products. So if you’re not on it, why not? Snap a pic from within it OR choose one from your gallery. Remember Instagram prefers square images, though you can now change to landscape or portrait. You can quickly gain followers as the app suggests your own contacts and others to follow. 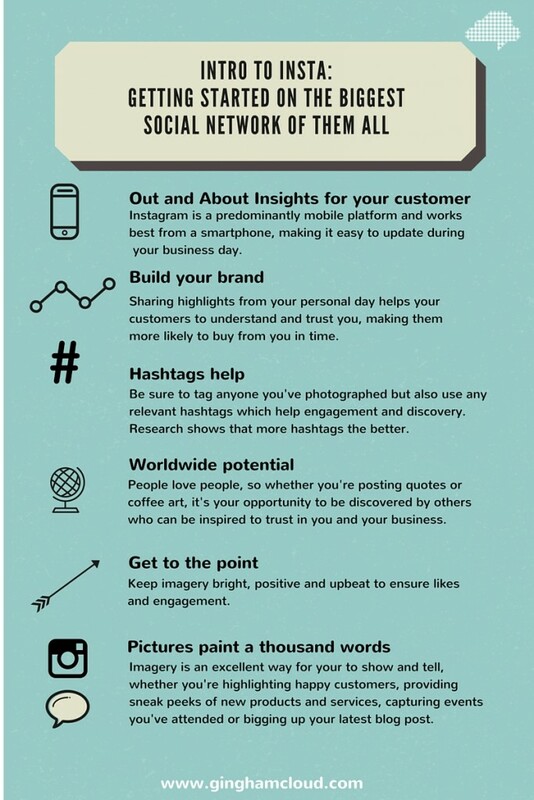 Plus the link in your biography can help bring followers back to your business. 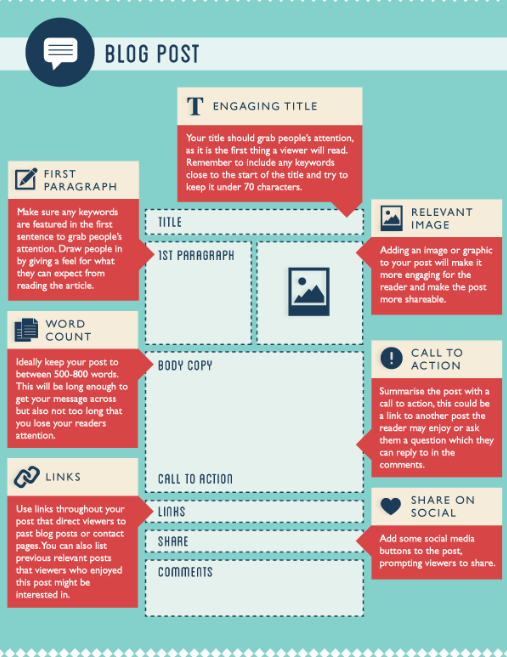 This info graphic shares some quick tips to get you started. Did we miss any? Let us know. So the Archers theme continues. It turns out that Emma’s going to make a website for the Grundy Turkey business. She hasn’t done it before but she says she can research it online. There are many different companies who will provide a “site in a box” ready to go but it’s the conent that will set you apart from your competition – and that’s where digital content specialists like Gingham Cloud can help. “We can take some photos of you and Clarrie, make it more personal,” she says. “even take some of the kids feeding the turkeys. She’s right, of course – a real story behind a brand and being authentic are key points to marketing successfully. 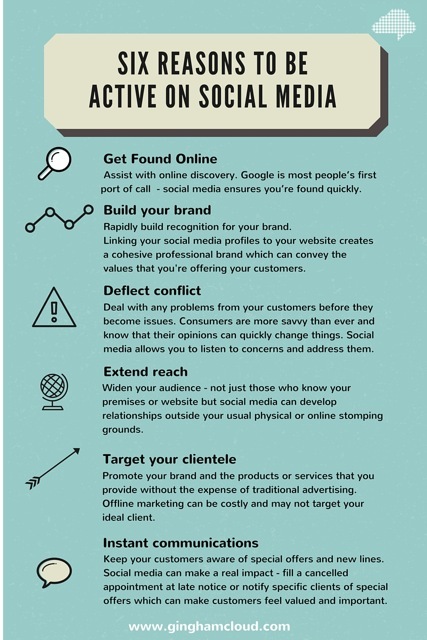 Here are 4 other must haves to make sure your website is earning its keep. 1 A memorable URL – when naming your business be sure that you can purchase an easy to remember domain name. Geographical names help with SEO for local people you may want totarget – Grundy’s Borsetshire Turkeys would be my recommendation for Eddie’s wares – though he should ensure to mention in his FAQs (see point 4) how far his delivery area reaches for those outside the county. 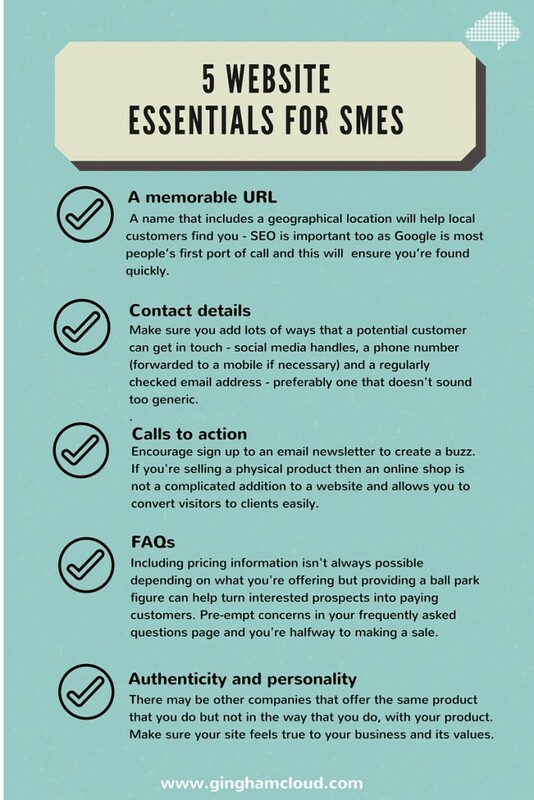 2 Make sure you’ve got a call to action. Eddie could do with an online shop and the opportunity to pay via PayPal. He could also have a newsletter so that his customers can see the turkeys fattening up so an invitation to subscribe to the Christmas countdown would be a good idea to get people excited about their birds as December approaches. Crucially it will provide him with a database of potential customers for next year. An online shop is notdifficult to set up, if you’re offering actual products. 3 Contact details – if like Eddie, you’re out and about, provide an email address (and make sure it’s checked often) and a phone number. You can forward office numbers to a mobile number if needed. It’s important that someone looking to do business with you can easily get in touch. 4 FAQs – a list of questions hat your potential customer might have. Even if you’re not happy to be completely transparent about pricing – it can of course depend now what you’re offering, giving a ballpark figure of what a potential client might expect to pay is a good idea. Think of all the queries that you’ve come across and pre-empt them. Your goal is to try and remove any obstacles for a website visitor to become a paying customer. There are many things that make me happy but the chance to blog on my guilty pleasure, Radio 4’s The Archers is certainly putting a smile on my face today. Eddie Grundy, wheeler dealer extraordinaire has got opposition in his Yuletime poultry business. The Grundys have kept and sold turkeys for as long as anyone in Ambridge can remember but now recent returners to the village, Rex and Toby Fairbrother are raising free range geese with an eye on lucrative Christmas sales too. In the face of this competition, Eddie thinks perhaps last year’s leaflets are looking a bit tired, and he should come into the twenty first century on “twitter gram”. He’s right, of course and even if you don’t know an iPhone from a ferret, it’s easy to get online. Though based in Hertfordshire and not Borsetshire, Gingham Cloud can help businesses everywhere take advantage of the wealth of business opportunities afforded by social media today. Get in touch to see how. More pressing on Monday? Check your source. It’s true that some of them can err on the side of cheesiness, although our friends over the pond tend to be oblivious to this. It turns out though, that Thomas Edison did not say anything about opportunity being disguised in overalls. 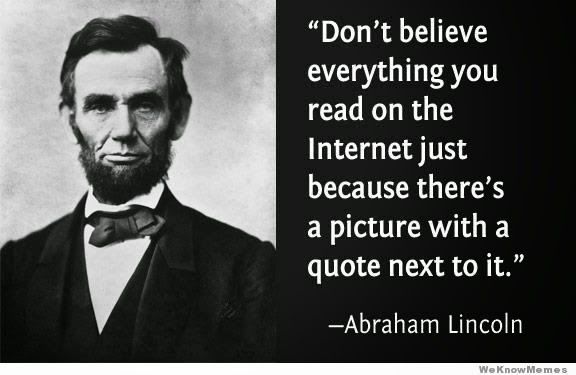 Of course not every quote you find on the internet is accurate but it was a timely reminder of previous editors’ warnings to always check your sources. It’s a great lesson and one I’ll be remembering going forward. Apt that I’ve been taught something on #WorldTeachersDay. So we’re half way through the working week, and by now you should be in your stride, checking things off the to-do list and making progress with both long and short term goals. 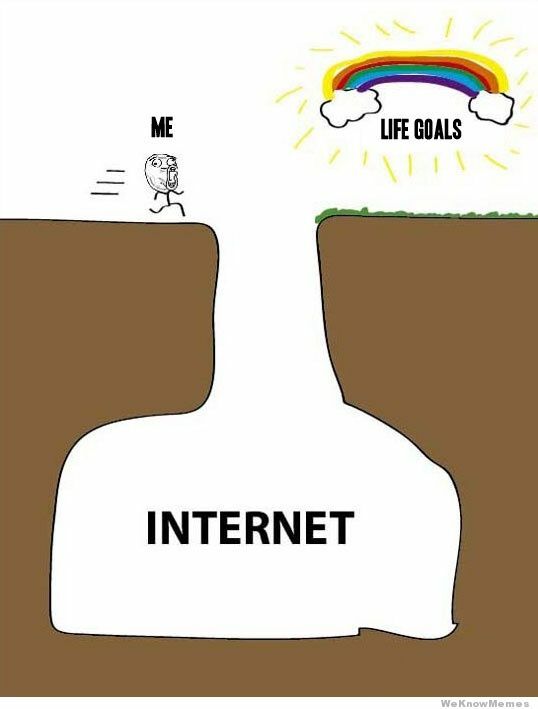 The problem for anyone dealing with social media is that spending all day on Twitter can mean that you’ve spend half the morning watching cat videos or creating your own memes before you even know it. 1 Firstly make your to do list bite sized,. Smaller quicker tasks will enable you to stop and check your feeds between jobs while still getting lots done. 2 An obvious one this, but please, turn notifications off – the pop-up window when you get new tweets or mails. 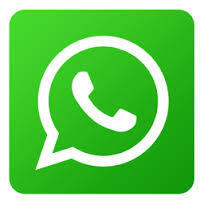 Close What’s App down. Try and focus just on the task at hand. 3 This is one I need to work on as I am guilty of far too many windows open at once but train yourself not to open more than one tab at a time. Decide what you’re going to do with that link you’re clicking as you do it – is it something you need to file elsewhere? Data you need to collate? Otherwise you and your objectives get lost pretty quickly. 4 Use your reading list facility – often you can check out longer items when you’re off line. 5 In the same vein, have a steal reel – a list of great articles/features that you think you may be able to borrow from to create content for your own site.